The vast South Pacific is an explorer's dream. 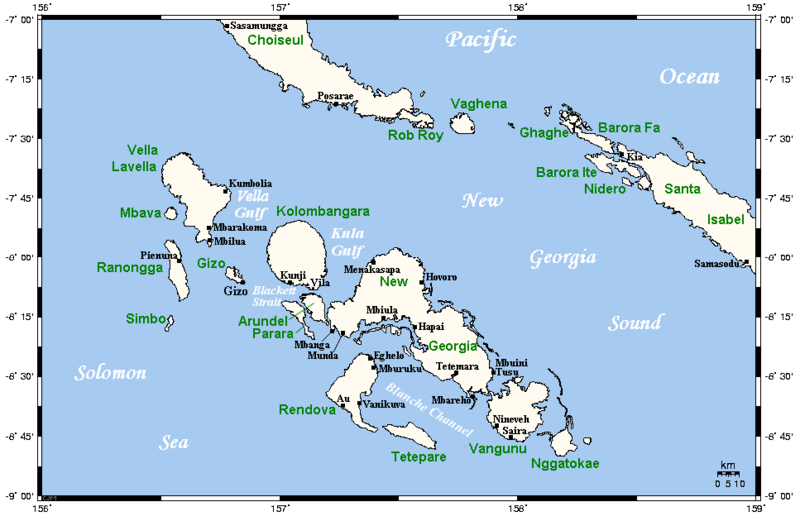 Just ask Cook, Baudin, Bligh or Mendaña, the first European to sight the Solomon Islands in 1568. My own Pacific initiation began in 1971 aboard P&O's SS Himalaya on a cruise to Noumea, Fiji and New Zealand. After an interlude of nearly 20 years, my Pacific explorations resumed and one of the consistent threads on these subsequent journeys has been to investigate the many WWII sites scattered throughout the region. Of course, the most rewarding and poignant locations are those where the fiercest battles took place. PNG, the Solomons, Borneo and Micronesia come quickly to mind. Sure, it's a bit of boy thing, most often germinated in childhood with dozens of Airfix plastic model kits of planes, ships and tanks. It's still a thrill to see these vehicles, albeit mostly rusty and derelict, in a jungle, junk yard or museum somewhere. My most recent visit to the Solomons was the third in eight years and each time there have been new and exciting finds. This time it was an overlooked P-39 Airacobra and a Stuart tank on remote Arundel Island in New Georgia. The P-39, not yet positively identified, crashed very close to the tiny village of Nazareti on the southern coast. Locals, machetes flying, took me on trail through rough jungle and casava fields to the site. Items like machine guns and ammunition are long gone and some untidy salvaging has made a bit of a mess of what remains. The villagers are all relatives of the chief they claim was the one who rescued the pilot after he bailed out. This I can't confirm yet as the only likely match from US records indicate the pilot is still MIA. Stay tuned. I hope to post updates here shortly. The tank is easier to explain. It was knocked out during a US attack on Japanese positions on the northern coast in September 1943. Apparently, the crew escaped, but the tank has been abandoned here ever since still with all guns in place. My guide, Tusker, from nearby Munda (where the Japanese built the current airfield, but quickly lost it to US forces) also shows me five 140mm naval guns installed at Enagai by the Japanese to defend the passage from seaborne attack. Another local, Barney Paulsen, shows me his own collection neatly arrayed in his front yard. Shell casings, medicine bottles, an aircraft engine and helmets are mixed in with piles of sundry debris including hand grenades. Barney pulls out his special box from which he produces the corroded remains of a Thompson sub-machine gun, magazine still in place. "The police tell me I can keep it as long as I don't try and fix it up," says Barney cradling the inert weapon like a Chicago mobster. The town is alive with all sorts of stories about who dumped what where and who made off with the leftovers. An American dump site is the source of most loot, but battlefield relics also turn up. Personal items like watches, badges and even dog tags - the well-known 'necklaces' worn by all US service personnel that identifies them ... in case. 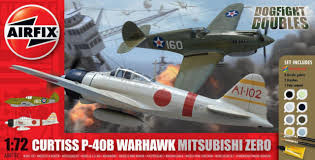 The well-known and sad truth is that shortly after the war, scrap metal salvagers combed the entire Pacific theatre picking up pretty much everything of value including entire aircraft, trucks, tanks, guns and anything metal. 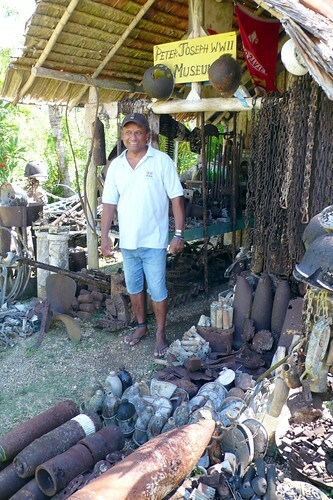 Scenes like this throughout the Pacific spawned waves of scrap metal collectors. would be worth a million dollars or more. Famous tales like the massive dumping exercise at Vanuatu's so-called 'Million Dollar Point' morphed into legend. Much the same happened at sites in the Solomons, including Munda. Consequently, the items left to explore are those ignored, missed or overlooked by the salvagers. 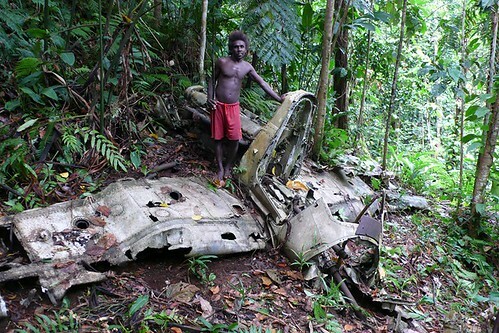 Modern relic hunters like Dive Munda's Graeme Sanson, continue to find missing aircraft in the water. The search and research continues, made considerably easier in recent times by the wealth of information now available on the web. Sites like Justin Taylan's Pacific Wrecks is a valuable resource for both researchers and browsers and through work by dedicated volunteers and professionals, has been responsible for the recovery and repatriation of the recovered remains of numerous MIA servicemen. Agnes Lodge, right on the waterfront at Munda and walking distance from the airport. Tours can be arranged from here. Zipolo Habu Resort (above) is on Lola Island and a short speedboat ride from Munda. Quiet and relaxing. And great fishing too. 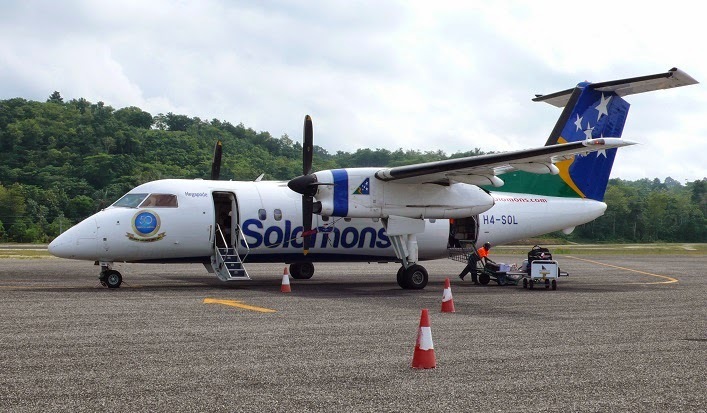 Solomon Airlines flies daily to Munda using a modern Dash-8 aircraft.